Description of "Short Stories for Success for Young Readers (eBook)"
As someone engaged in activities relating to Youth Development, I was more than pleased when, two years back, Ms.Geetha, prompted me to compile a book of short stories for the benefit of children in primary classes. She is a teacher in one of the higher secondary schools where I regularly visit to conduct programme on Personality Development. She must have read and felt good about my first book: SHORT STORIES FOR YOUNG READERS – BOOK 1. The idea was ringing in my ears all along, only I couldn’t decide on the theme for the new book. While conducting programs on Personality Development for high school children and college students during the last five or six years, I always saw in their eyes their deep desire to be competitive and be successful, and I also saw in them their helplessness. Many of their earlier years’ conditioning is already deeply ingrained in them and breaking free from their unhelpful conditioning is always a great challenge. Awareness dawns on most children a bit late. The correction involves struggle and pain. I realized yet again that their personality has to develop from much younger ages, if they really want to succeed. So I decided that if I were to write another book of short stories, it should focus on qualities, traits, and characteristics that help one to succeed and that the book should target younger minds in the primary classes. I pondered over various qualities, traits and attitudes that shape one’s personality, towards happiness and success, and then the idea of a new Lexicon struck me. Avvayar the Great, the much acclaimed female poet of Tamil Sangam period of Southern India and her poem collection titled ‘Aathichoodi’ came to my mind. Her ‘one-moral-message-for-each’ basic Tamil alphabet gave me the necessary inspiration. I narrowed down my selection to one important quality, trait or characteristic, among many, that help one to succeed, to represent each English alphabet. Thus my new Lexicon was born. Then I searched for stories from the great Epics of India, history, and folk tales that could convey effectively the importance of each quality, trait or characteristic. I borrowed the fundamental concept of these stories from my memory about them, from the internet, and from other publicly available sources, and then developed them to suit the age group of children for whom I have written this book. The end result of six months of my work is now in your hands. I hope you enjoy reading it and draw the right lessons for life. I hope parents and teachers enjoy reading these stories to their children and help them develop right perspectives. A few of my close relatives, friends, students helped me in completing this book, by going over it in great detail and offering their valuable suggestions, ideas, comments, and criticisms. Though I am not naming them here individually, I thank every one of them for their very valuable help. I thank Ms. Geetha for planting the seed for my second book for young readers, in my mind. I thank artist Shri Mariappan of P. M.Arts, Shencottai for his exemplary drawings for some of the stories in this book. Finally, I dedicate this book to Lakshmi, my wife for her unstinted support to all my interests and pursuits. 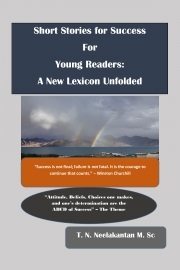 Reviews of "Short Stories for Success for Young Readers (eBook)"